You'll be £13.50 closer to your next £10.00 credit when you purchase United States Army Armored Divisions of the Second World War. What's this? The routing of the British and French Armies in May and June 1940 by the Wehrmacht’s armoured divisions caused a major rethink by the US Army’s senior leadership. The result was the formation of the two armoured divisions in July 1940; the first named ‘Old Ironside’ and second designated ‘Hell on Wheels’. In 1941, a further three armoured divisions were created; the third (Spearhead), the fourth (remained unnamed) and the fifth called ‘Victory’. The following year seven more were created, the sixth, seventh, eighth, ninth, tenth, eleventh and twelfth. The final two armoured divisions formed in 1943 numbered the sixteenth and twentieth. All but one of these powerful formations went on to see service in the European Theatre of Operation (ETO); the exception being the 1st Armoured Division that served in North Africa, Sicily and Italy. A good approach and an extraordinary documentary visual archive. The author considers their operational and fighting doctrine and uses informatively captioned then and now photographs of the armoured fighting vehicles and other equipment employed to chronicle almost 30 years of rapid development and expansion. The author has provided very good descriptive text and captions to an excellent selection of rare images. The series of books is always applicable to serious enthusiasts and professionals in offering a visual augmentation of an existing military history library. They are also useful to novices who want to make an easy entry into an area of military history. 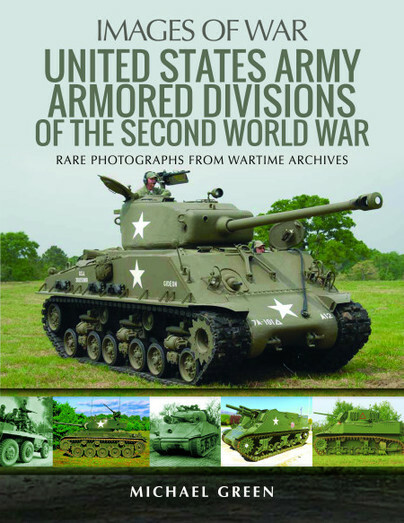 This is also the case for this book, but it is more important in that it is a comprehensive study of the development of US armor into the armored divisions deployed in North Africa, Italy and Northern Europe with great success. Where the book comes into it's own is, as you'd expect from the series, in the imagery. Basically after the text detailing what vehicles each division was authorised to maintain, there are extensive photographs of all the vehicles and equipment mentioned, showing wherever possible each variant... All in all, a thorough coverage for the armoured enthusiast, modeller or re-enactor. A good mix of photo reference, both in terms of the wartime archive illustrations but also the modern colour images, inside and out, of surviving examples of many of the AFV types discussed within the texts. A handy reference for modellers in particular.